When I set out to write this post, I was determined to narrow down my thousands of Japan photos down to my top 10. Yes, you read that correctly, thousands. I honestly didn’t think it would be that difficult. As I sat down and flipped through my photos, however, I knew it would be impossible for me to narrow it down to only 10. As many people have, I watched Marie Kondo’s Netflix show, Tidying Up With Marie Kondo. Yes, I too have that damn saying, “does this bring me joy?” stuck in my head and I couldn’t shake that earworm as I looked over these photos. While yes, they are visually beautiful photos, they also are the ones that produce the best (joyful) memories of my trip to Japan. So what was originally a “Top 10” photo post, quickly changed into a “My favourite” photos post as the number quickly climbed over 10. Below you will find my favourite Japan photos (listed chronologically by the date they were taken). Note: All of the photos and videos I took on the trip were captured on an iPhone XR and were edited using either Snapseed or Darkroom. 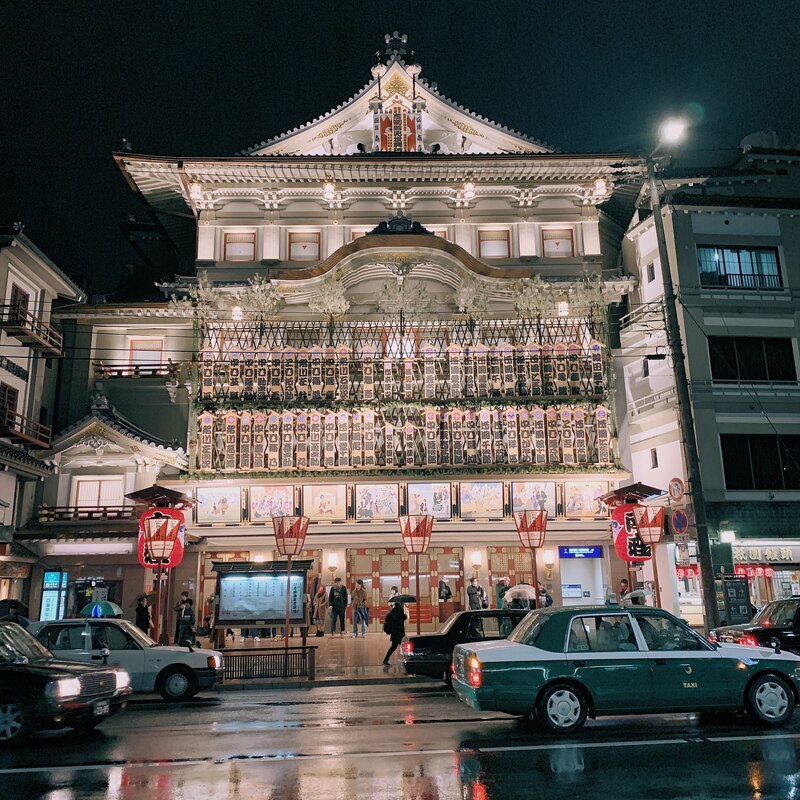 This beautiful ivory building greeted us as we exited the subway in Kyoto, the first stop on our Japan tour outside of Tokyo. This theatre was located along the street that our hotel was on. This meant that we walked passed this beautiful building every day. 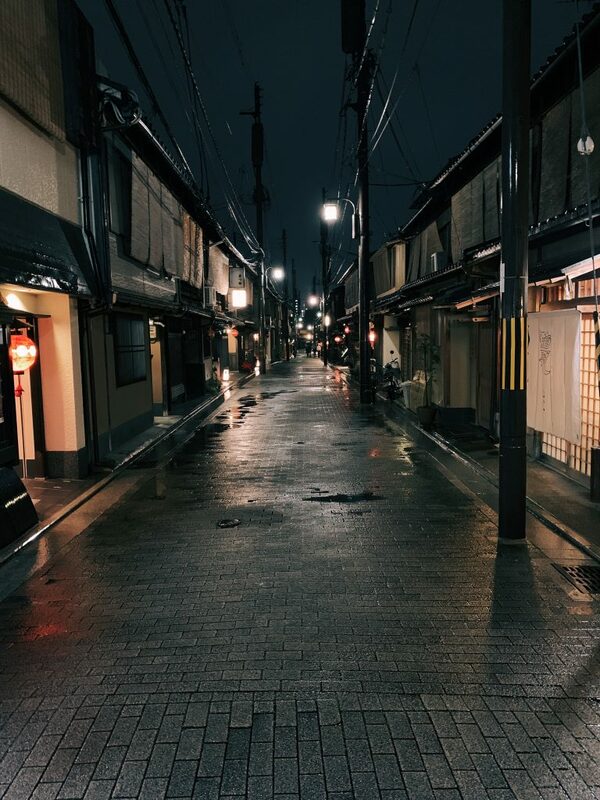 When we arrived in Kyoto the Gion District was one of the first areas we explored. This beautiful area of the city was right behind our hotel room! It was lightly raining on the night that we arrived, so we grabbed an umbrella and went exploring. These streets were like stepping back in time. Gion District, Kyoto’s most famous geisha district. On our first full day in Kyoto Shyla suggested we visit Arashiyama, located on the far west side of Kyoto. Arashiyama is a fair distance from the city centre so we had to take a train to get there. Arashiyama is worth visiting because of how much sightseeing is available in such an easily walkable area including Arashiyama Mountain, a bamboo grove, and the famed Togetsu-kyo Bridge which can be seen in the background of this photo. 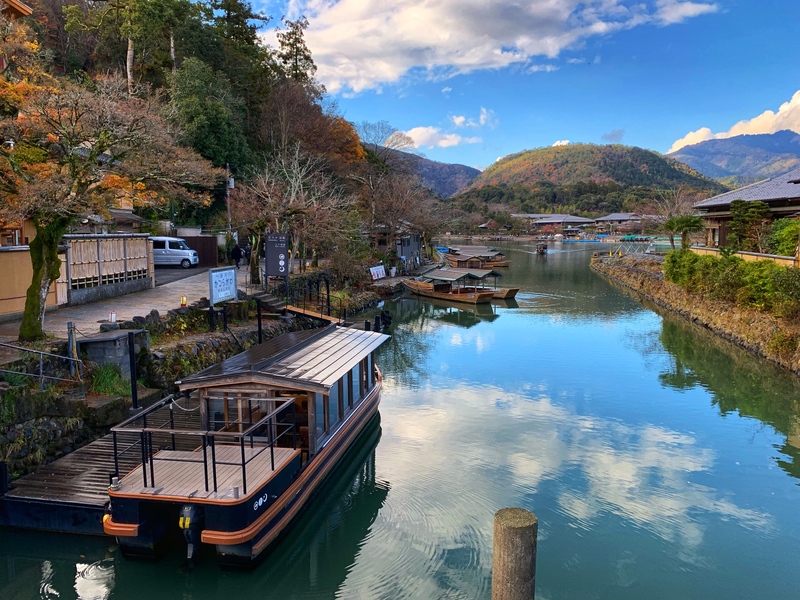 This boat in the water of Arashiyama and the sky made for a beautiful photo. 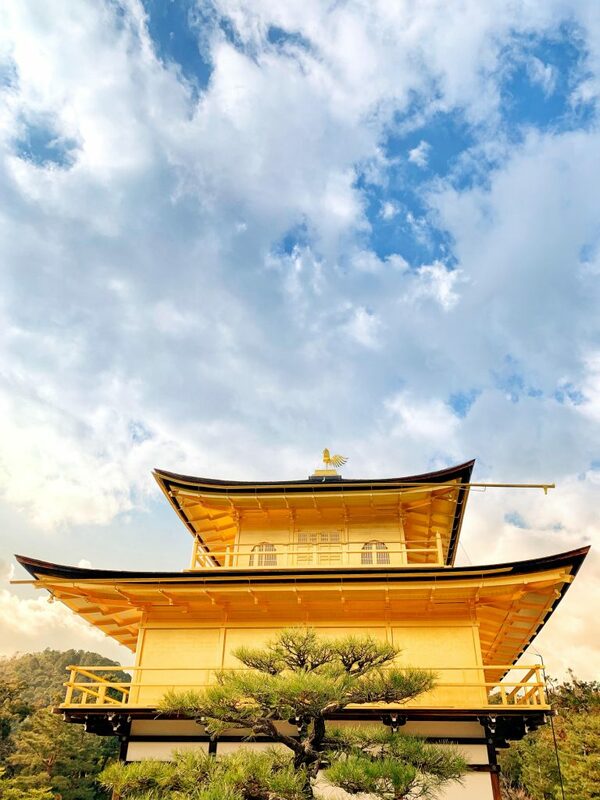 Kinkaku-ji Temple is a Zen temple in northern Kyoto and is sometimes referred to as the Golden Pavillion. It’s top two floors are completely covered in gold leaf which made photographing it a lot of fun. It was a beautiful day so trying to catch the sun in the right light was so enjoyable. Submission to the Shot on iPhone Challenge. Kinkaku-ji Temple in northern Kyoto was so beautiful and it was a great day for photos. 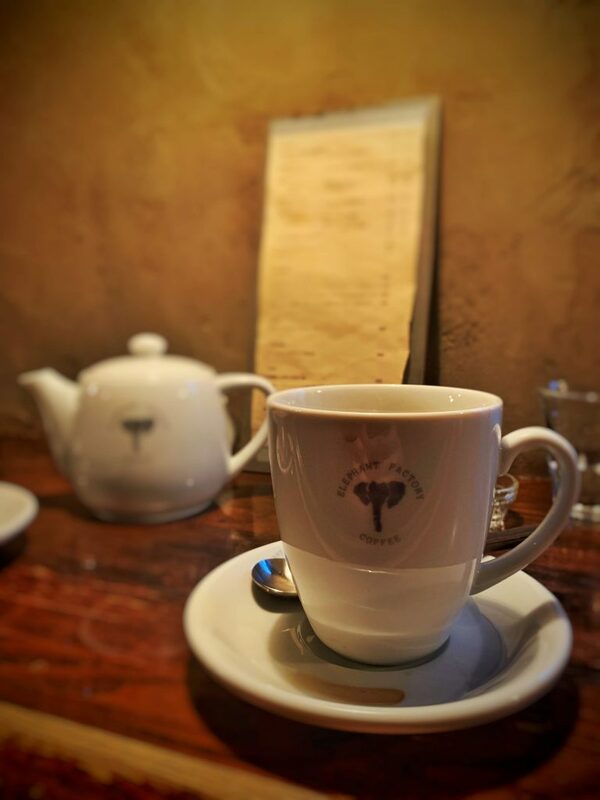 Simon and Martina, a YouTube couple living in Japan, did a spotlight on Elephant Factory Coffee and I immediately knew I had to visit this cafe. It was located on the second floor of a side street near our hotel with very little signage indicating it was there. Unless you were looking for it, I don’t think you’d ever stumble across it. I loved the cups and photographing this cafe was a joy. I loved this little coffee shop on the side streets of Kyoto. 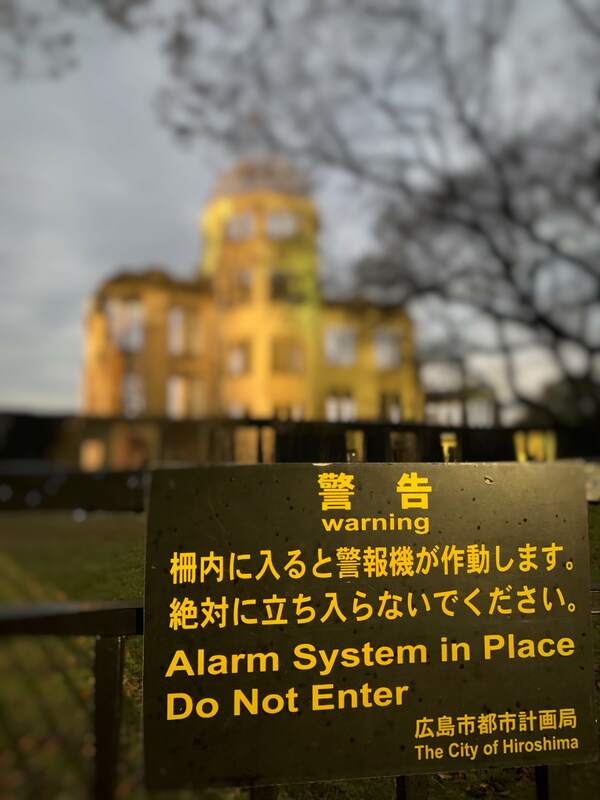 The longer you’re in the presence of the Atomic Bomb Dome the more powerful it becomes. The shell of a building that still stands after the equivalent of 12-15,000 tons of TNT detonated overhead is truly a sight to behold. There were a lot of great opportunities to photograph this building but I like this one, a little bit of a different perspective. This sign hanging from the fence surrounding the Atomic Bomb Dome in Hiroshima. Located on the island of Miyajima this shrine is very cool. While the gate is technically in the water, the tide recedes as the day goes on allowing people to walk right up to the gate. We arrived before the water completely receded so we watched and waited for the shrine to be accessible. I took so many photos of the shrine and the coins that litter it’s base. However, I love the angle and framing of this photo. 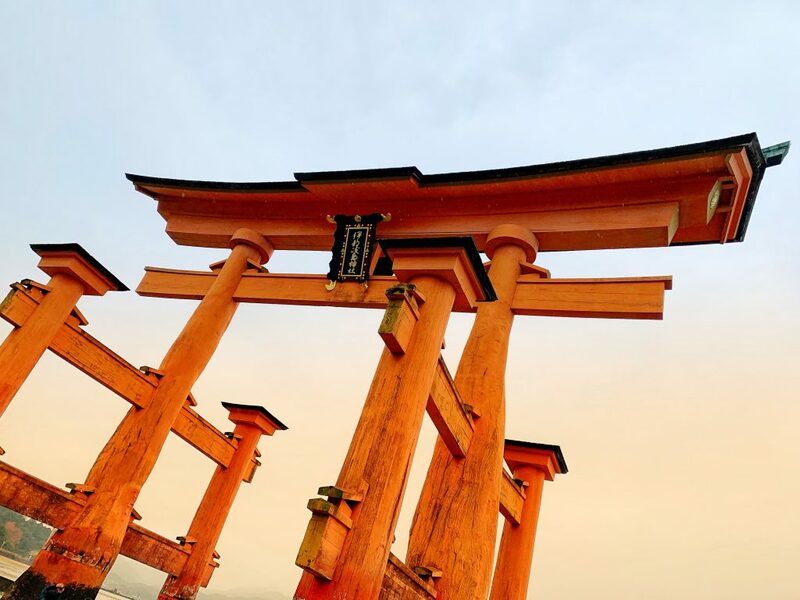 Itsukushima Shrine located near the island of Miyajima is in the water and often referred to as the “floating” torii gate. Maybe there is something about a near-death experience that made me pick this photo for the list. I’m kidding, but climbing down a mountain in the pitch dark is certainly concerning. The walk up, however, provided us with some great opportunities to take stunning photos. 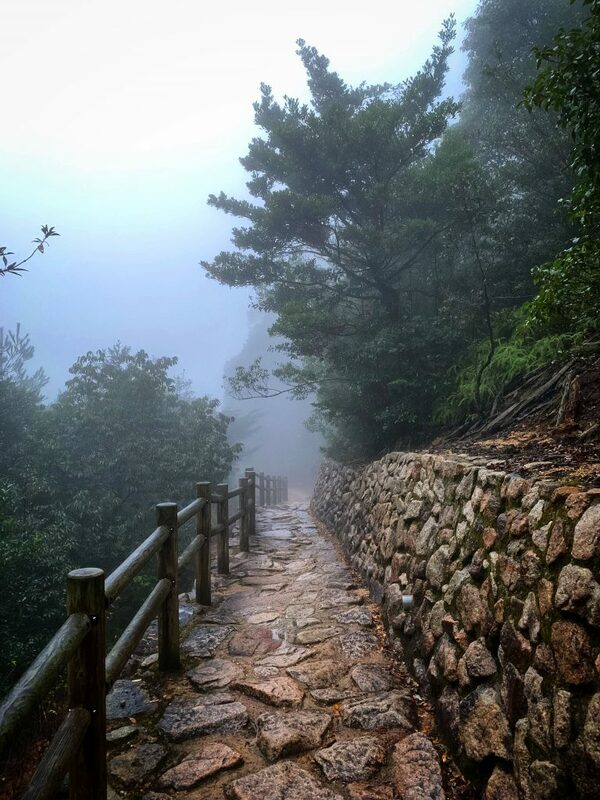 The fog and stones on this path made for a great photo. I keep coming back to it, that’s why it made the list! The fog, stones, trees, and railing made for a great photo while climbing Mount Misen. When I was getting ready for this Japan trip I’ll admit, I was watching and reading a lot about photography, especially iPhone photography. One of the things I keep seeing is people who over edit their photos and make the colours “un-natural”. I love bold photos and colours that are totally blown out. That might make me a bad photographer but hell, I love those kinds of photos. When we visited Kobe I knew that the vibrant colours of this photo were not going to be an issue! 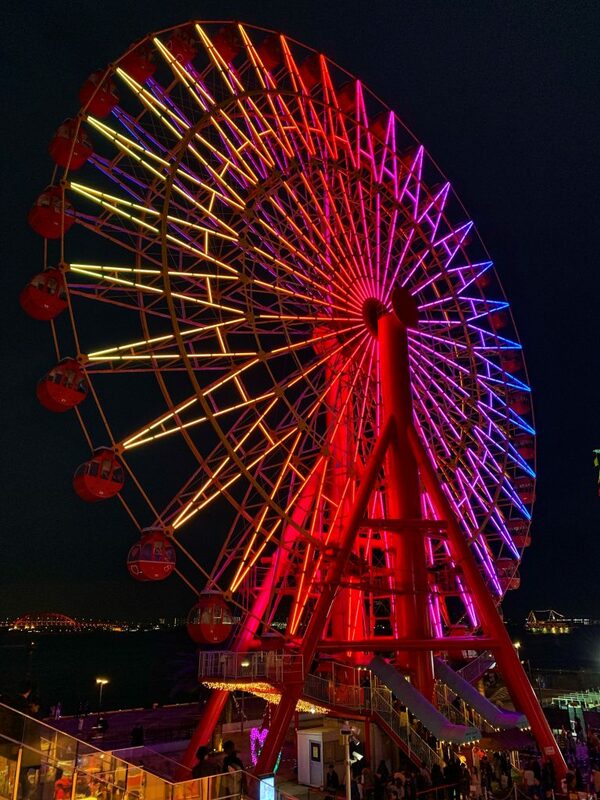 This Ferris Wheel was a prominent landmark at Harbourland in Kyoto. It was so colourful and stood out against the dark night sky. Deer were everywhere at Nara but this photo includes the deer and the temple gate which I thought made for a cool photo. Plus, I like this little guys ears! The colour in this photo was also really vibrant and popped so I thought it turned out well. It helps that Shyla thinks of this meme which makes it that much better. 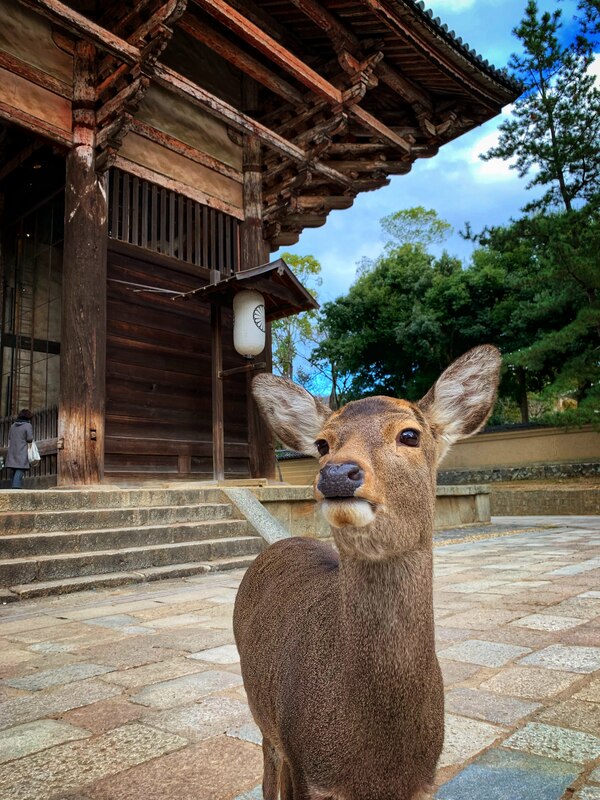 This deer at Nara was so photogenic, he/she loved being on camera. Nara provided us with some great opportunity for photos. As we were crossing a bridge we noticed this cool little water spout/well behind a tiny food hut. 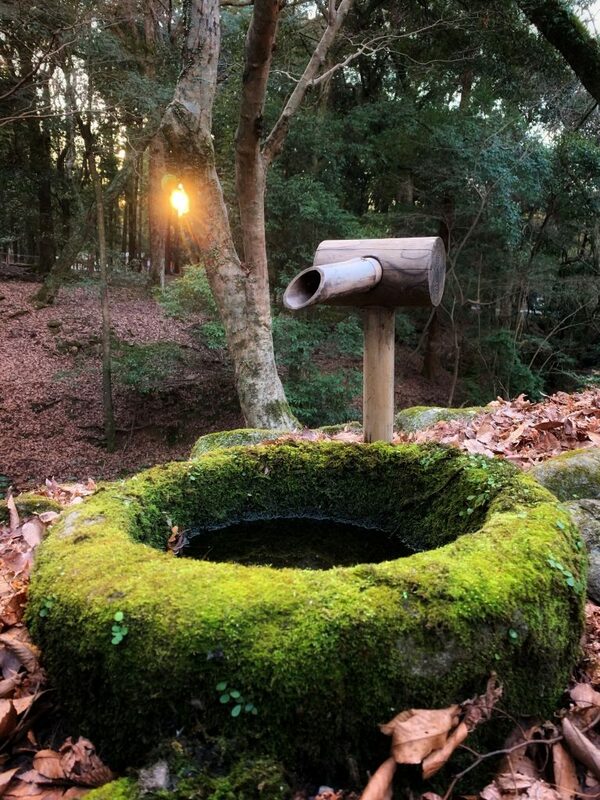 The sun through the trees, the moss around the well, and the slightly hazy glow of the photo made me really like this picture. You have to always be thinking of interesting perspectives. This water spout/well behind a small food hut in Nara provided a great dusk photo. This shot was all Shyla if I remember correctly. 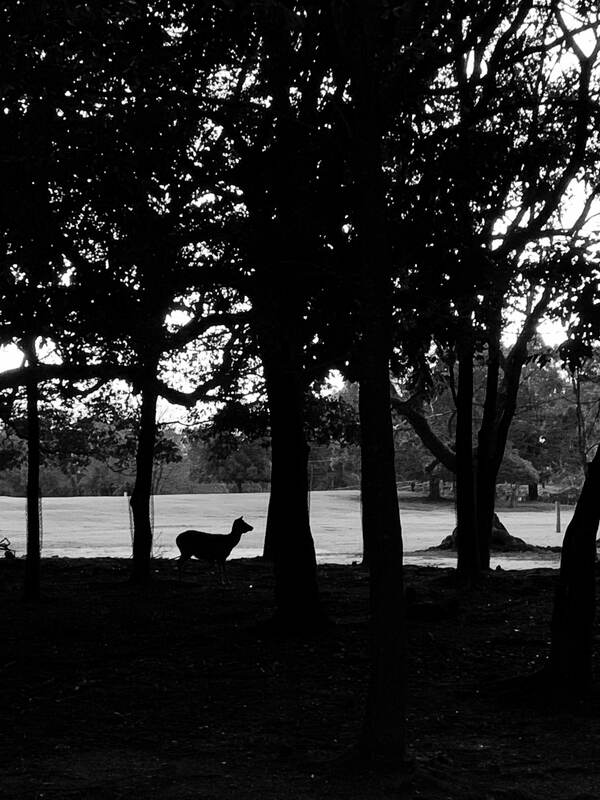 She saw the deer through the trees. I just thought the silhouette feature on Snapseed would make for a cool photo. Adding a red nose and a Christmas greeting made this the perfect Japan Christmas card. This photo was all Shyla, I just grabbed the camera and snapped it. This photo is from the Festival of Lights in Osaka. 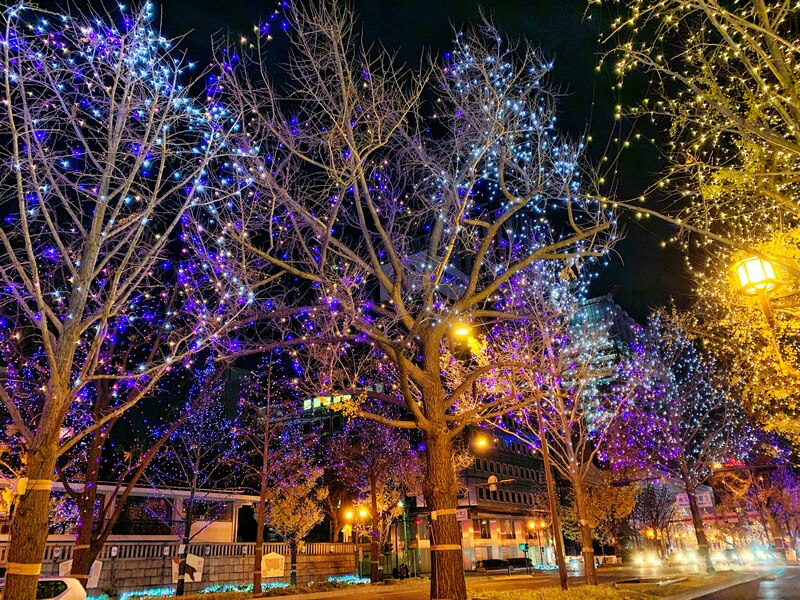 The Midosuji Illumination is officially recognized as the street with the most illuminated trees in the world. Lights on this street are hung for 4 kilometres. We got a lot of great photos on this street but I like the warm glow in this photo and the detail of the lamp on the right-hand side. It’s a warm photo on a cold night in Japan. The Midosuji Illumination near our hotel in Osaka. It kind of pains me to list this as one of my favourite photos of the trip. There was a lot of garbage that washed up on shore near the Toijinbo Cliffs. However, the blur, lighting, and framing of this shot made for a really cool photo in my mind. According to Shyla, this is written in Korean. What stories does this plastic tub tell? Probably nothing exciting but we can imagine. 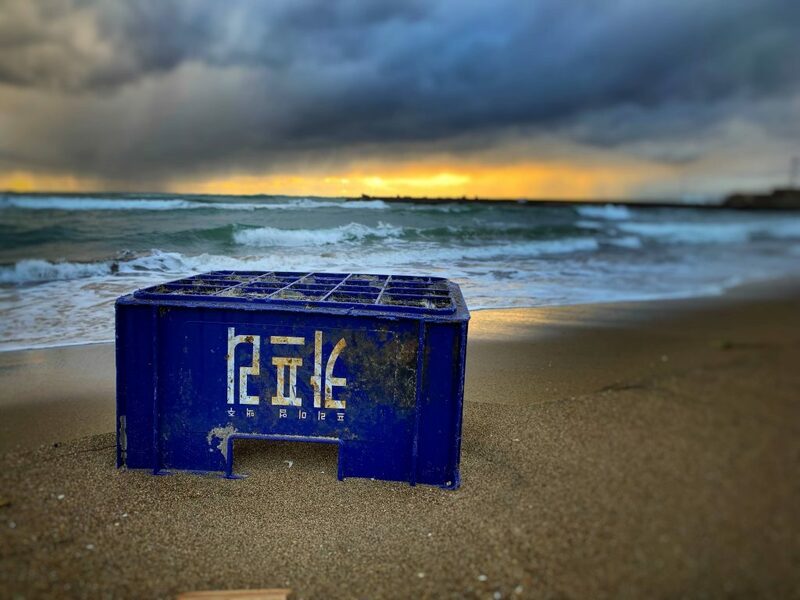 It’s never nice to say trash it good, but this blue plastic tub washed up on the beach provided an interesting photo while gazing into the Sea of Japan. This photo was taken before we actually arrived at the Toijinbo Cliffs, it was also taken before the rainstorm really rolled in. This photo depicts the calm before the storm. Although I feel that the photo captures the windy essence of the day for some reason. Maybe it’s the clouds. Anyways, the Sea of Japan and the clouds really cooperated with me for this photo. 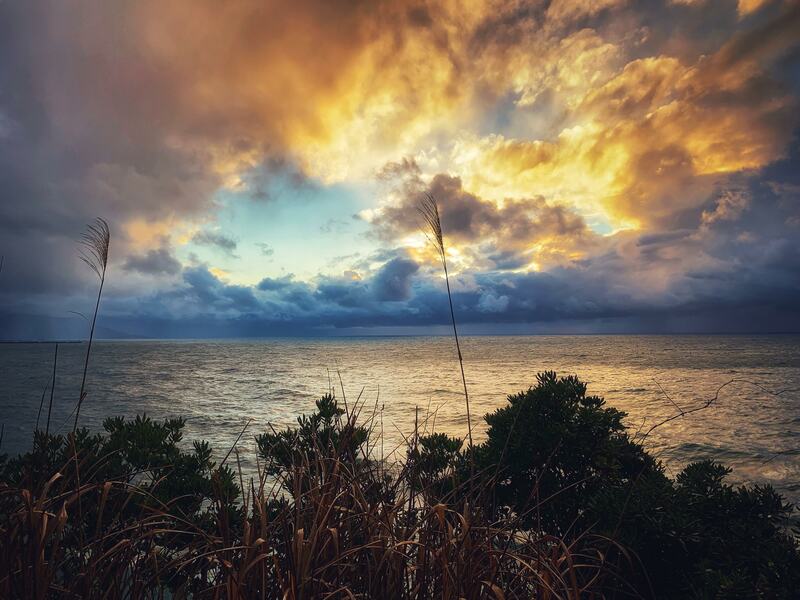 There was a storm brewing to the northeast. The clouds opened up just long enough to snap this cool photo. We discovered this shrine on our first night in Kanazawa. It was tucked between two buildings in a shopping area not far from the Nagamachi District. 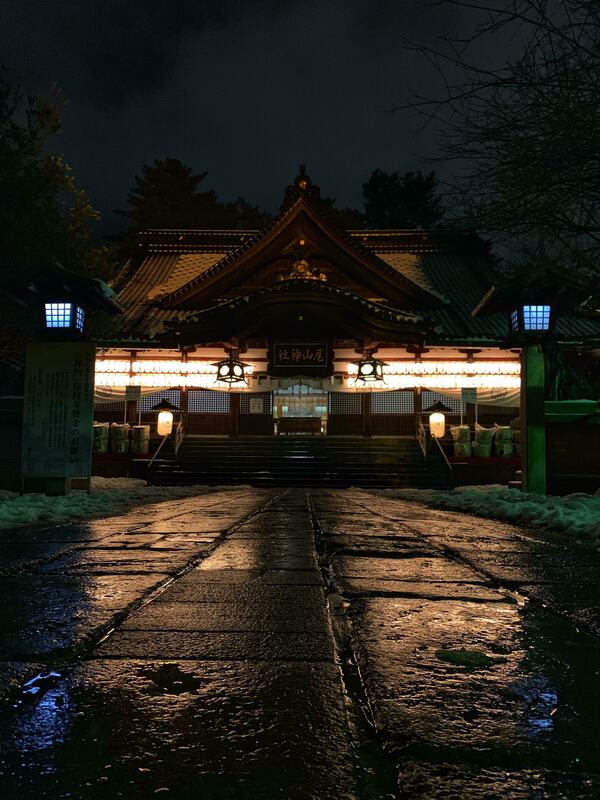 Similar to our first night in Kyoto, albeit a fair bit colder, it was raining. However, I think rain really enhanced the photos we took on our trip. I love the reflections that the water picks up. It warms up the otherwise cold stones leading up to the shrine and brightens the photo without taking away from the allure of the night time photo. This shrine was tucked between two buildings in Kanazawa. The rain made for a great picture! This was a real treat and a part of history that neither Shyla or I are soon to forget. The Emperor’s Greeting was held on January 2nd and had the largest attendance since 1990 with 154,800. The Japanese emperor made his last New Year appearance before he abdicates later this year (April 30th). This is the first time this will happen in Japan in over 200 years. We waited more than 2 hours to get into the Imperial Palace but it isn’t normally open to the public, so it was worth the wait. This photo was taken after we exited the palace. The sun, sky, and water made this a really cool photo. There also seems to be a soft glow across the whole photo which makes it feel even more special. The beautiful clear sky, sun, and the water made this photo turn our really great. Sometimes photos just look great. That’s what happened here. This was a fun photo to take and I was lucky to have a beautiful subject to capture (Shyla). 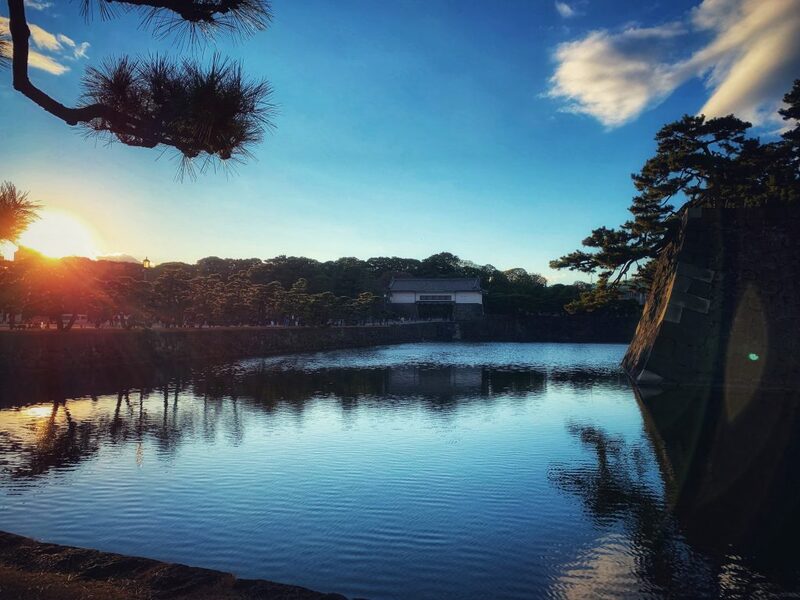 This photo was taken after visiting the Imperial Palace and in my opinion, this photo turned out perfect. It was shot with portrait mode and lightly (very lightly) edited in Snapseed. The colour just pops between the sky, Shyla’s outfit and her eyes. This is easily a top three trip photo from the trip. 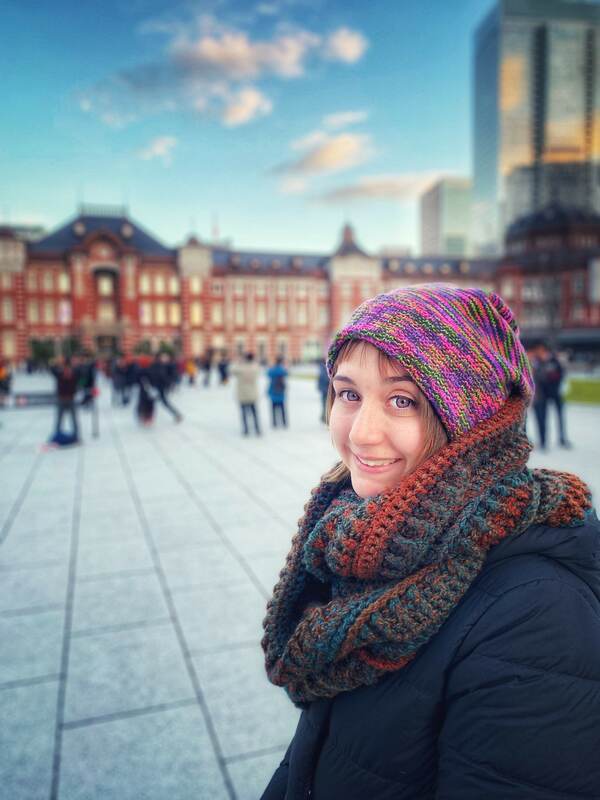 Shyla in front of Tokyo Station after the Emperor’s Greeting. This was a photo that just needed to be taken. We visited Senso-ji Temple on January 4th and there was still New Year festivals going on. We stepped into a little area just off the path where the festival stalls were located and when we turned around we had Skytree and a beautiful pagoda overshadowing us. Not much editing went into this photo. 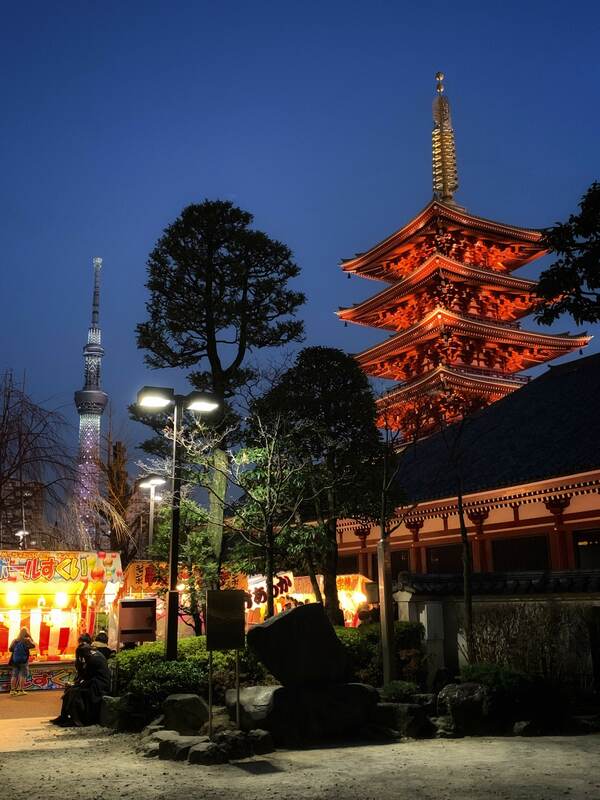 A pagoda at Senso-ji Temple with Skytree in the distance. Two towers, one old and one new. 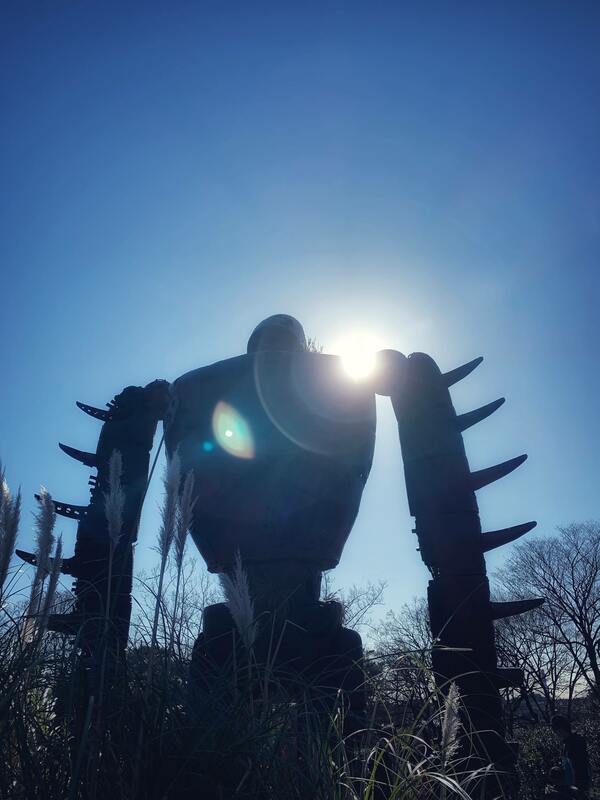 Yes, we got photos standing in front of this giant metal robot from Laputa: Castle in the Sky created by Studio Ghibli (admittedly, a film I watched after visiting the museum). However, there was a line up to take photos with him so you feel kind of rush to get the perfect photo. From behind though, we managed to get some really cool photos! The lens flare and silhouette of this metal giant was too cool. You also were not permitted to take photos inside the museum, here on the roof it was fine. This giant robot from Laputa: Castle in the Sky was located on the roof of the museum, one of the few places photos were allowed. What do you think? Were there any photos you saw posted that you felt should have made the list? You can see all the albums from the trip here. No, I didn’t include all 3000 photos I took. Sometimes great photos are just there, waiting to be taken. Sometimes those photos are just there, waiting to be ruined by Shyla. This is one of those photos. Joking aside, Shyla jumped into this photo and now we’re stuck with her in it forever… FOREVER! I’m kidding, this was a cool photo and walking up the beach in Fukui provided us with some really good photo opportunities. 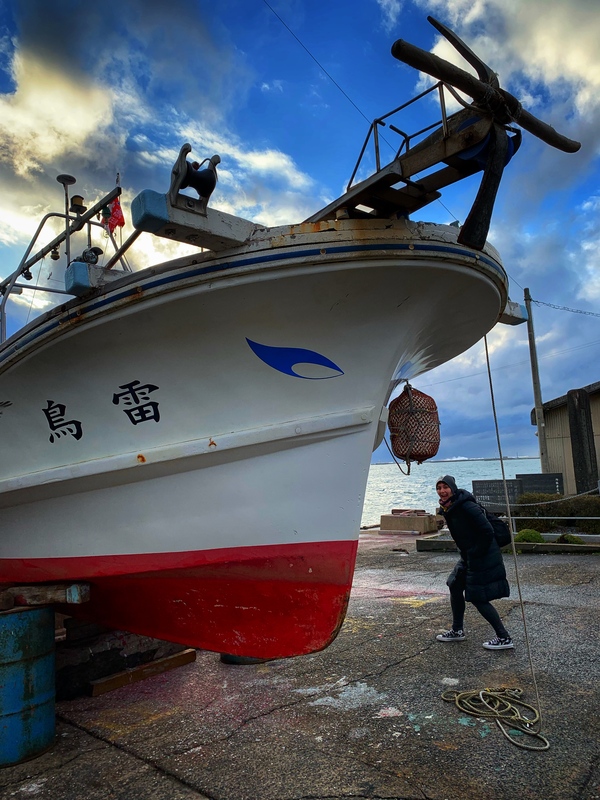 Shyla and Boaty McBoatface, on the shore of the Sea of Japan. It’s hard to narrow down the best of photos from Kyoto, but this photo, in particular, has been brought up in conversation. So let’s include it in this list. Kyoto was such a photographers dream. 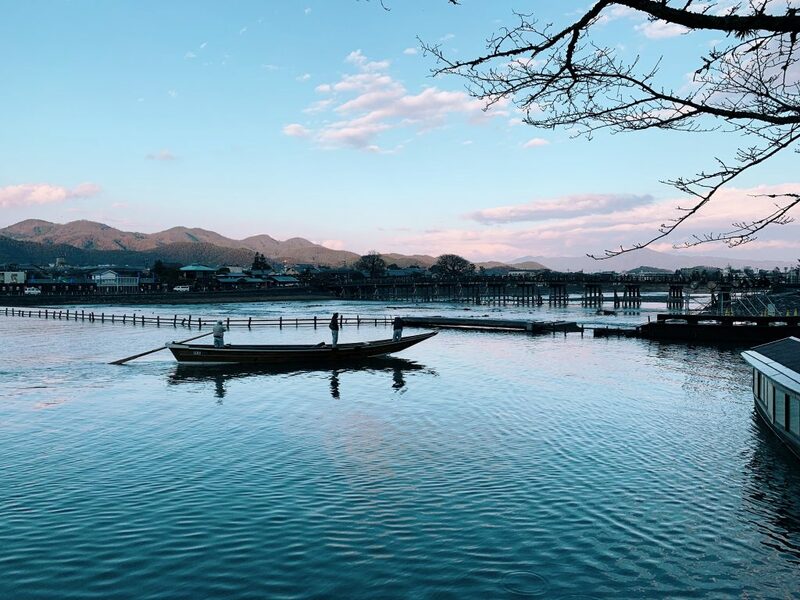 The Ōi River in Kyoto with the Arashiyama Mountains behind. So peaceful. Ryan / Very special collection – good job and thanks for sharing! Thanks Susan! It was a great trip and I loved sharing the photos and some of the stories on this blog. Blogging on my phone was kind of cumbersome and I had to go back and edit a lot of the posts (once I was home) because there were a number of autocorrects that I wasn’t able to pick up on. I’m planing on doing two Training and Development sessions based on this trip. The first will be about the trip. 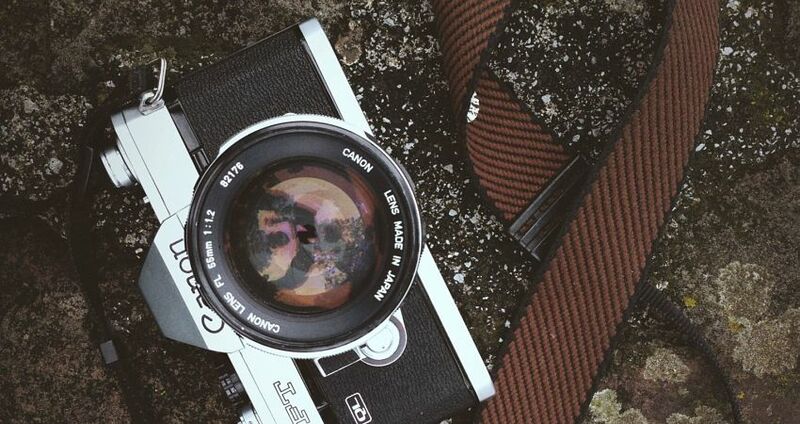 The second will be a mobile photo editing workshop.